Basically “Treasure Island”, but with gratuitous man-eating bugs. I say gratuitous because they’re barely used – this movie would be essentially unchanged if you removed them. But there they are, nonetheless – towering over Long John, and bellowing their maneating howls as they shudder in harmless CGI malevolence. So what else need be said? I suppose I could go on about the story, but it’s more fun to hone in on the weird little details, such as Blind Pew’s googly eyes. They’re shown in the first 30 seconds, and I immediately shouted at the TV, “you CAN’T be serious!” Apparently they were. Oh, and let’s not forget the rubber skeleton mask. Weird. Not good, but very, very weird. 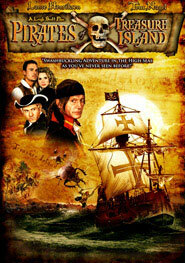 This entry was posted in Movies / TV and tagged adventure, low budget by Bilgemunky. Bookmark the permalink.